Max is a pro at morning naps…..
but the elusive afternoon nap is not exactly something he’s embraced. 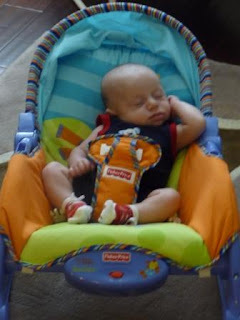 Until one recent afternoon…..
On most days, I rock him, sing to him, lay him in his crib. No nap. 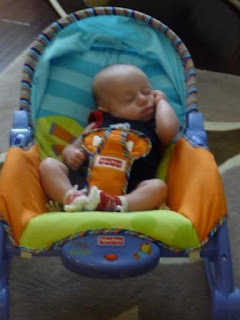 So I bounce him, shush him, put him in the swing. No nap. Then I play with him, rub his head, put him in his chair. No nap. So I walk with him, pat him, and put him on a blanket on our couch. No……nap. Which is why some days I find myself steering our monster of a stroller aimlessly around Stoneridge Mall with the other new moms and their no-nap babies, weaving in and out of stores in a constant flurry of movement because being in the stroller is the only thing that will keep Max asleep. And I realize that the aisles at Sephora are way too small as I continuously bump Max’s enormous limo into the lipgloss shelf and run over a whole display of vanilla-grapefruit smelly lotion. Which of course makes me realize that, after walking away with a sample size leave-in conditioner and my lips dressed in the latest coral shade, that I have got to teach this child how to nap AT HOME. When my mom was here, we tried our best. And Max slept in the afternoon. For six minutes. And then after lots of hard work, for eight more. “Now I know why you can’t get anything done around here!” my mom sighed. Thank god someone realized that. And then this afternoon came. Max started to get sleepy when we were playing on the couch. I moved away from where he was resting on his blanket and let him zone out for a bit by himself. I turned the Spa Channel on our TV and crossed my fingers that the music would help him to bliss out, like he was in Aruba waiting for his deep tissue massage while sipping a fruity drink (oh wait….that’s me!) He was chill for about ten minutes, and then started to fuss….so I wrapped him in his blanket and picked him up…..he snuggled in close, put his hand on my chest, and closed his eyes. And then opened them and smiled up at me. And closed them again. And then smiled one more time as if to say “I can DO this Mommy!”, and fell asleep. 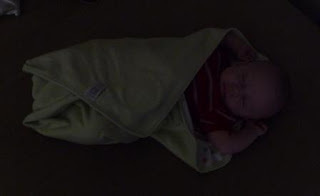 And I layed him down on the couch, snuggled in his blanket, where he slept for a very peaceful 40 minutes. BLISS. FULL.